HA NOI (VNS) — Ha Noi T&T is looking to defeat the defending champions Becamex Binh Duong in the late eighth round of the Toyota V.League 1 tomorrow. This will be the first match of the league after a two-month break during the Tet holiday. Although the capital city's representative will not have two key players during their trip to the Go Dau Stadium, their coach said they had found the best substitutes. Gonzalo Marronkle and Hoang Vu Samson have been sidelined because of red cards from a previous match. "Their disappearance would reduce our strength remarkably, but it is okay because we still have other quality players who would fill up their position," said head coach Phan Thanh Hung. Samson has achieved a hat-trick and Marronkle had scored twice after seven rounds. The former champions arrived in Binh Duong Province last Friday to familiarise themselves with the field and to acclimatise to the hot weather. T&T had performed poorly since the beginning, with only nine points and were ranked eighth among the 14 participants. Hung, however, still believed that his team would improve its position and jump up the rankings after tomorrow's game. "T&T did not start well but they are still a strong rival with skilful players, who have a complex playing style," said Le Thuy Hai, executive director of Becamex Binh Duong. "However, our aim is to become the champion of the V-League 1, so Binh Duong have to beat all opponents, and T&T are not an exceptional case," he added. 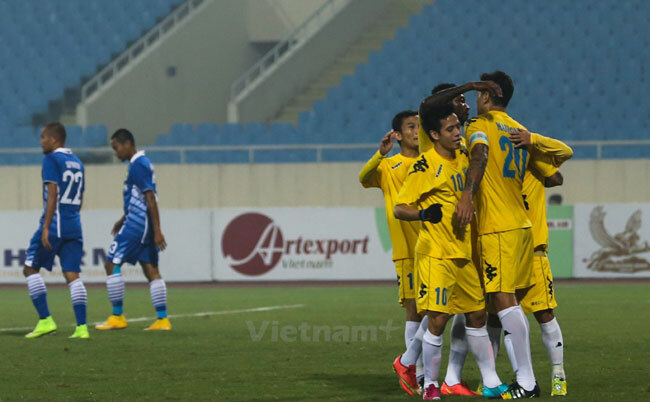 Binh Duong have almost no hope left at the AFC Champions League after three losses. Their key competition is now in the V-League 1. While the strikers were asked to sharpen their scoring skills, the defenders were working on resisting high balls. Le Tan Tai, Le Cong Vinh and Hoang Van Binh have trained hard and would be responsible for the free kicks. Binh Duong was ranked third in the rankings table with 15 points, just one less than leaders Quang Ninh Coal and Thanh Hoa. A win tomorrow would push them to the top position.